When it comes to moments that have changed the course of history, we usually think of inventions like writing, the wheel, and the lightbulb. But what about the ideas that have caused massive upheavals in the way the world spins? 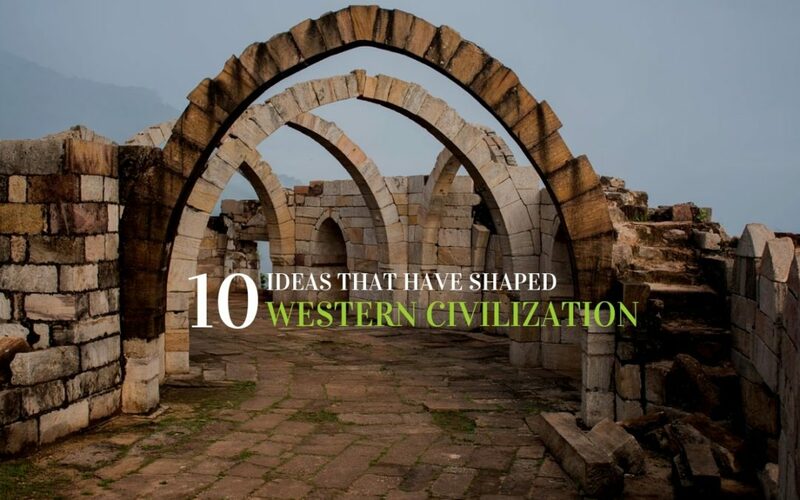 Here are 10 ideas that forever changed the Western World. The Greeks did a whole lot more than run around half naked and throw stone frisbees into the air. They were masters of intellectual craftsmanship, and their thoughts and ideas have formed the foundation of Western intellectual institutions down to today. Aristotle’s powerful methodology give us the power to determine the validity of a statement by its structure alone, regardless of content, allowing us to create order and meaning out of the words we say and write. Whether or not you consider yourself a believer, it’s difficult to ignore the world-changing effects of belief in one deity. Prior to monotheism, ancient peoples would pray to whatever god or goddess related to their particular need. If another country triumphed over them, then of course that god must have been stronger. But the advent of monotheistic beliefs and their attendant scriptures gave credence to the idea of personal accountability and the injunction to build society on immutable principles across national lines. We tend to think of Democracy as originating in the land of stars and stripes, but one an argue it began long before that, in Medieval Feudal England with the signing of the Magna Carta. Over the centuries, the kings and queens had to give up certain powers and privileges in return for the support of the nobles, creating a condition where the absolute power of monarchy was weakened, and laying the framework for the idea of a modern representational government that could echoe the design of ancient republics like Rome. Ask any child today, and they’ll tell you the earth revolves around the sun. But did you know that wasn’t always the perception people had of the universe? While Galileo and even Copernicus can’t be directly credited with the idea of a sun-centered solar system (the idea has come up several times in the last few millennia), their earth-shattering proposals for the architecture of the cosmos opened the door for scientific, evidence-based inquiry in other areas. Who would have known that the almost biblical action of an apple falling from a tree would spawn a whole genesis of scientific ideas that have played a crucial role in our understanding of the universe? Gravity, calculus, and the laws of motion are just a few of the integral ideas explored by the 16th century wigged genius, Sir isaac Newton, who incidentally was also an alchemist (you know, those dudes who attempt to turn everything into gold). The idea is relatively simple: explore new lands, settle the area, and add to the economic power of the mother country through drawing natural materials from the various lands of the realm—things like silver, spice, and sugar. But add a few competitors to the mix and you end up with a complex horse race of jockeying participants, whose wars and alliances over the issue of global expansion have fueled the last several hundred years of history. For thousands of years, some people were slaves, and others were slave owners, and that’s just the way the cookie crumbled. But starting around the time of the French Enlightenment, moralists and thinkers like Voltaire (expressed in the satire of Candide) began to question the morality of this idea. Over time, countries like Great Britain put an end to the practice of slavery, although others like the United States had to duke it out with some internal dissention. The slow process of emancipation has also spawned more recent movements like women’s liberation and racial equality. The notion that there is a whole lot of stuff going on under the surface of a person’s outer being is not necessarily a new one; ancient peoples acknowledged the idea of an inner world. But with the advent of rationalism and the enlightenment, the idea of emotion-based subconscious processes became buried until it was unearthed by the psychotherapeutic work of Freud, Jung, and others who built on their findings. True, we did say we would steer clear of actual inventions. But the internet is more than an invented network of connectivity. It’s the very idea of conducting life in a digital sphere, including research, leisure, commerce, and more all on a globally linked network. It’s become so ingrained in our lives that it’s almost impossible to picture life without it. Moreover, the corollary idea of social media has changed the way we interact and view others, creating new paradigms and rules of engagement between people.